I've taken a lot of liberties with this fricassee and if you see my notes below, though the technique is similar, I've adapted it to make it easier and a little lighter and tried to give the dish a little Indian vibe. There's a pinch of saffron threads and smoky coriander for that rich color and flavor. A fricassee is a richly flavored one-pot French dish that gets flavored at different levels, the mirepoix, the herbs and spice add their magic to the chicken. There are a few steps to making it but it's one of the large batch dishes that you can make it in advance and save yourself some time during the week! Usually, you should cook a fricasse in a medium-size heavy Dutch oven. Honestly, it does wonders for this dish because of it's heavy cast iron base and lid. The chicken cooks fast due to the uniform heat distribution and the steam, the chicken will have a tender texture once it is cooked. I used Le Creuset's new mix and match cast-iron dutch oven that comes with either a red or blue lid to match the colors of the French flag! I cheat a little in this fricassee. I've skipped the boquet garni and the liasion. A fricassee can be pretty rich and heavy with cream and eggs, I skipped all of this and made the sauce creamy by emulsifying the liquid in the Dutch oven to give a creamy and silky sauce. If I'm craving a little bit of heat, I'll add a teaspoon of red chili flakes to the Dutch oven when I add the coriander. This is a great one pot meal, one you can prepare in advance and eat during the week. I also sometimes throw in a can of beans or some chopped char. 1. Pat the chicken dry with clean paper towels. Season with salt and pepper on both sides. Melt the butter and the olive oil in a medium-sized Dutch oven (5.5 quarts) on medium-high heat. When the butter starts to foam, place the chicken skin down and brown on each side for about 5 minutes. The chicken pieces can be fried in batches. Remove from Dutch oven and keep the chicken aside on a clean plate. 2. Reduce the heat to low and to the same Dutch oven, add the diced carrots, onions and celery. Cook for 8 to 10 minutes until almost the vegetables start to just brown. Then add coriander and saffron and cook for another 30 seconds with constant stirring. Sprinkle the flour over the vegetables and mix until the no visible flecks of flour can be seen. 3. Pour the wine and chicken broth into the Dutch oven and stir to mix. Increase heat to high and bring the contents to a a boil. Now return the browned chicken pieces to the Dutch oven along with the bay leaves. Cover with the lid and reduced heat to medium-high. Cook for 25 to 30 minutes or until the chicken is completely cooked (internal temperature 165F). Reduce the heat to a gentle simmer and remove the chicken pieces and bay leaves. Now transfer 3/4 of this liquid left in the Dutch oven to a blender and pulse until almost smooth. Return the liquid to the Dutch oven, stir in the lemon juice. Taste and adjust seasoning if necessary. Now return the chicken back to the Dutch oven. Garnish with the chopped tarragon and parsley. Serve hot with a good rustic country bread. Disclaimer: This post sponsored by Le Creuset and Williams Sonoma. All opinions expressed are solely my own. Limits. They should be called restrictors. I realize, I place too many of these little fences around my thoughts. Self-imposed, they are and stifling they can be. But, to grow, these limits need to be pushed away. At first, even pushing the walls down seem hard and daunting. The anticipation of emotions of fear and nervousness about the unknown. Should success be the end goal of every endeavor? I don't know and I don't think I will ever have an answer to that but the thought of having attempted brings me comfort. But it also brings me strength, the strength to break down these limits and experience. To make mistakes and learn, isn't that the true purpose of any venture. For the past few weeks, I've been working on a little personal photography project, one to learn and grow from. My goal was to try and capture moments during the process of cooking. 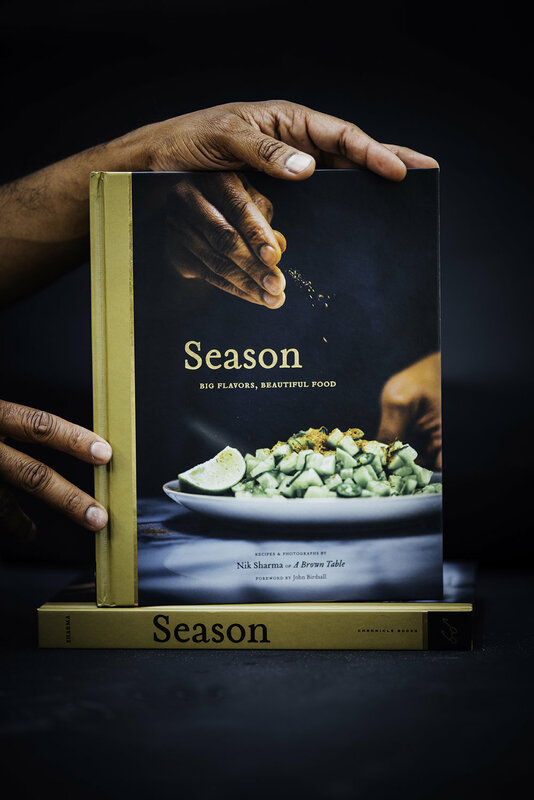 I've also been wanting to step away from focusing more on the final product but depict some of the stages through which ingredients get transformed. Some moments are more exciting than others but even the simpler moments have a story to tell. It could be something as icky as pulling the strings out of a pumpkin or something as delightful as icing a cake. But every step in preparing a meal is special which is why I find preparing food a grace and an even bigger joy to share. I do hope you enjoy this series as I share these moments with you. 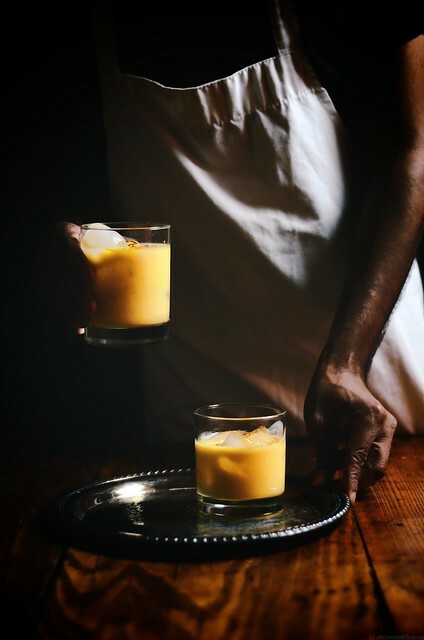 I don't think I could have predicted that I'd be sharing a pumpkin lassi recipe in fall . But here I am, doing just that. Tinged with the brightness of saffron and the sweet flesh of roasted pumpkin purée, this yogurt drink is dreamy. 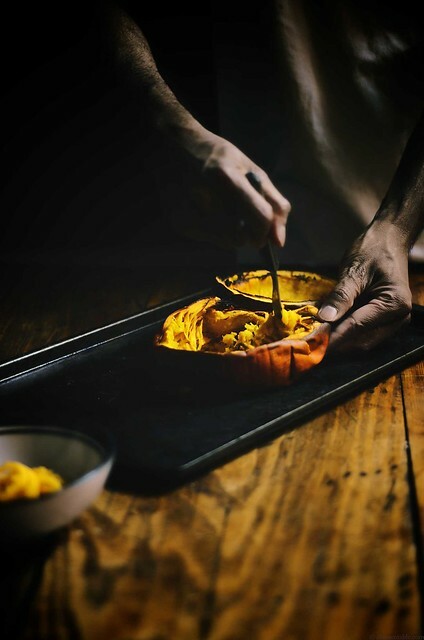 Dreamy with the colors and flavors of fall and one of its golden harvest, the spectacular pumpkin. So drink up and enjoy! If you want to make your own pumpkin purée at home, you can do what I did. It's relatively easy and simple to do this and whatever, I don't use I freeze in airtight ziploc bags until needed. 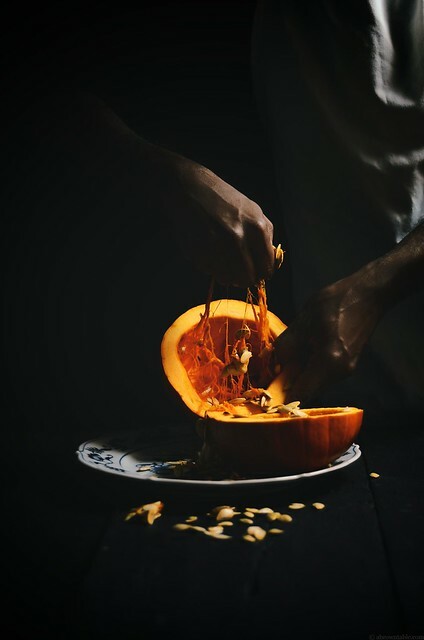 Start with a small pumpkin and cut in half, discard the strings and seeds, place it on a baking sheet at bake in a preheat oven at 400F for about 35-40 minutes or until the flesh is soft and tender. Remove and scoop the flesh out and blend it in a blender until completely smooth. For every 1 cup of puree, I add 1/4 cup of water to keep things moving in the blender. Try to use as little water as possible. The purée should be as smooth as possible. Don't use greek yogurt, use the regular plain, unsweetened variety. 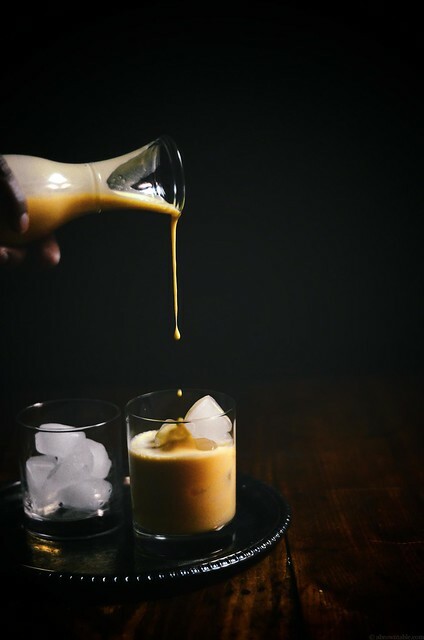 Avoid the temptation to use milk to prepare the drink in place of water. Lassi is traditionally made with chilled water. This apple blackberry and geranium tart by Imen is absolutely gorgeous but so is everything on her blog. This persian broccoli kuku (or koo koo) , think frittata with a lot of lovely flavors. This spectacular salted caramel apple snickers cake. A buckwheat pizza crust recipe, I need to try this weekend. 1. Place all the ingredients together in a blender and pulse for about 1 minute on high speed until smooth and combined. Taste and adjust sweetness if needed. 2. Pour into chilled glasses containing ice. 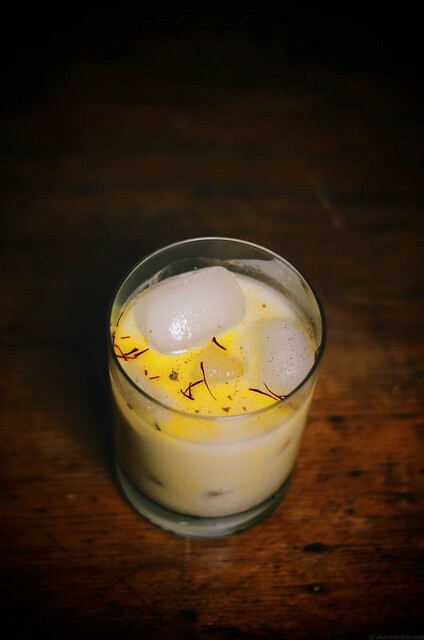 Serve immediately and garnish with strands of saffron if desired.